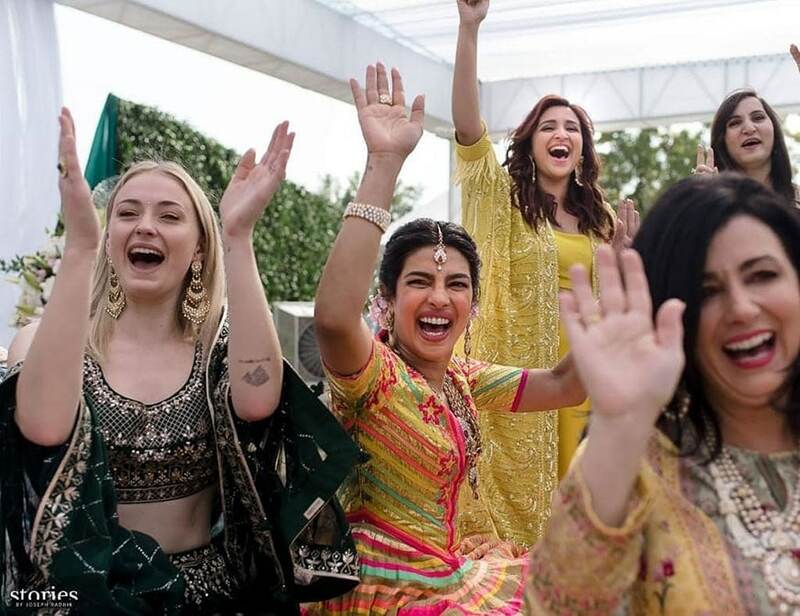 The first pictures from Priyanka Chopra and Nick Jonas' Mehendi ceremony are out and the newlyweds look ravishing in Abu Jani and Sandeep Khosla's outfits. 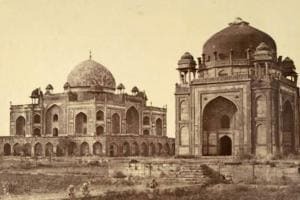 She twirled in a courtyard while he grooved to the beats of Galla Goriyan; he was lifted in the most filmy style while she laughed her heart out. 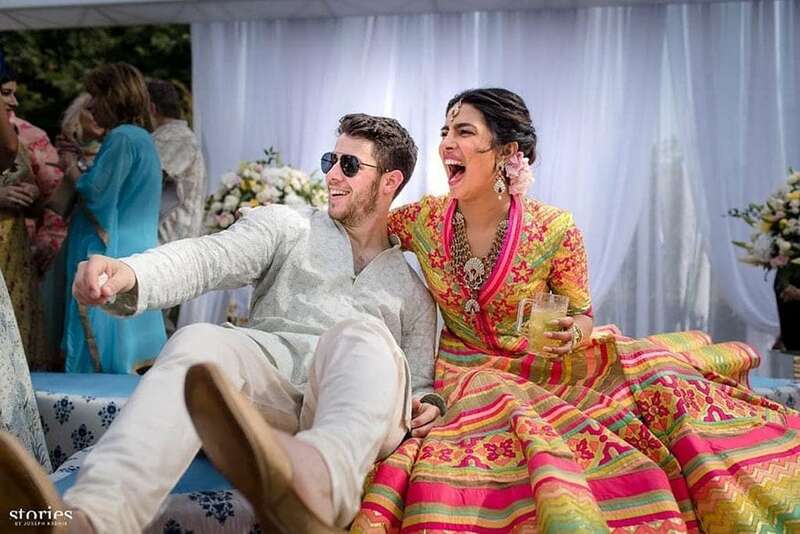 We can't stop adoring the couple in their bright and colorful mood and outfit at the mehendi ceremony of Priyanka Chopra and Nick Jonas. 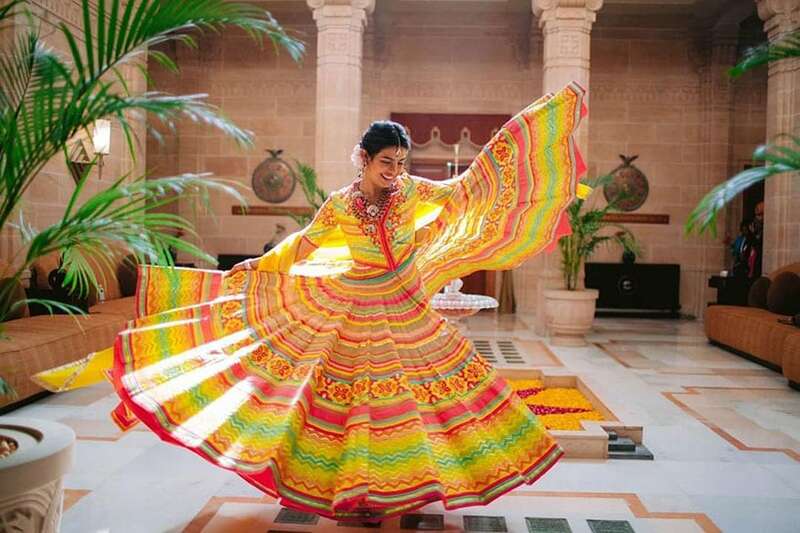 While it had already been established that the couple will wear Abu Jani and Sandeep Khosla for one of their ceremonies, we must say Priyanka definitely made the right choice. Bet you, this Desi Girl is the happiest and the most radiant bride you will ever witness. The Quantico star, donned a traditional multi hued lehenga and a crop top with flamenco sleeves weaved by the ace designers duo Abu Jani and Sandeep Khosla inspired by the AJSK collection. She teamed the colorful quirky ensemble with heirloom jewellery by Jani-Khosla's own Jewellery line Saboo at AJSK. 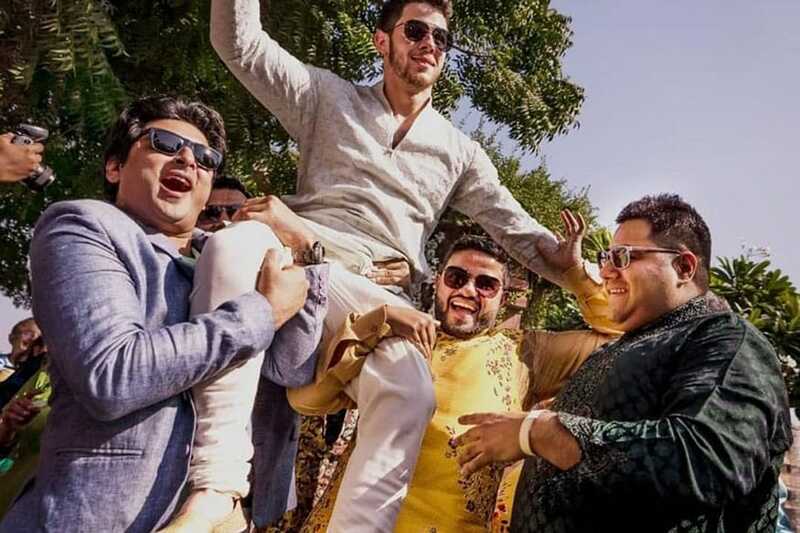 The groom, Nick Jonas, looked adorable and dapper in aqua Bakhia kurta and jutthis. He also had mehendi smeared on his hands with Priyanka's name on it. Reportedly, on October 6, she arranged a meeting with the designer-duo Sandeep Khosla and Abu Jani to discuss her outfits for the D-day. In the past, Priyanka has already been spotted wearing Khosla-Jani twice with Nick Jonas. She donned a yellow Salwar-suit for her Roka ceremony and a red saree for an event crafted by the ace designers. The designer duo and the couple took to their Instagram handle to post the cheerful pictures of the bride and groom. Here are the pictures from the fairytale Jodhpur mehendi ceremony and they are definitely worth bookmarking. 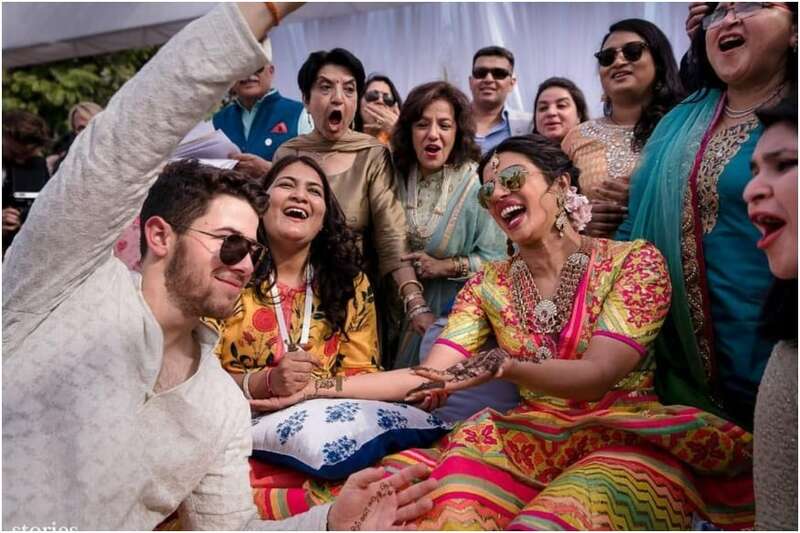 Nick Jonas and Priyanka Chopra at their mehendi ceremony. 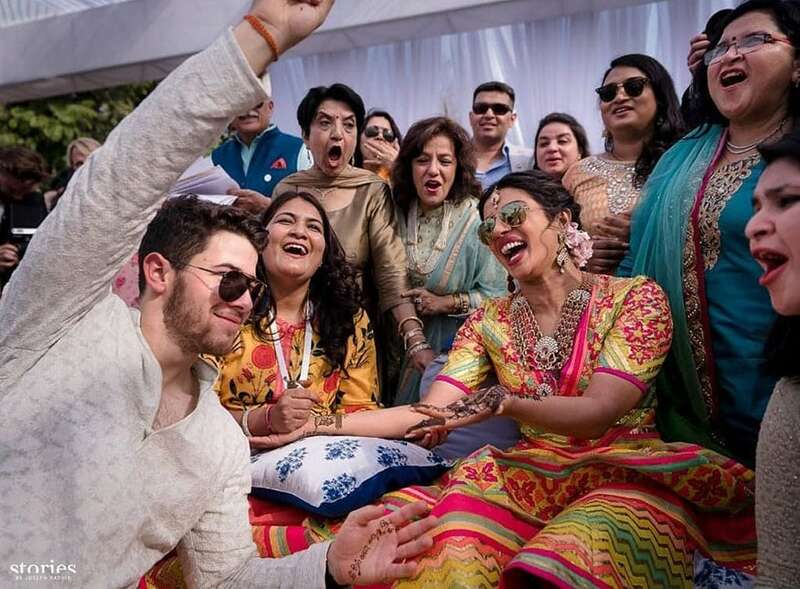 Nick Jonas having gala time with friends and family at the mehendi ceremony. Priyanka Chopra with her friends and family at her mehendi ceremony.